Chapel, Rupert, and the rest of the Chapel Chronicles family all wish you a very happy New Year!! Every New Year’s Eve, my best friend and I wait until close to midnight and try to make words using sparklers while my dad takes photographs. 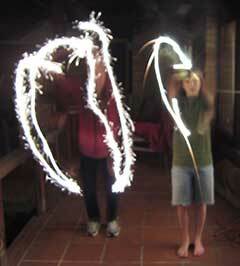 The sparklers don’t last for long so we can only spell small words like our initials or shapes like hearts. Definitely not the words in this strip! Capturing the effect of lit sparklers is difficult enough, but capturing it in a faux Polaroid is even trickier. In order to get the right effect, I studied a lot of photos of real life people writing words using sparklers. I colored the drawing as normal, then used a special brush to write the lettering and get the proper glow effect. Then I de-saturated all the colors and gave them a sepia tint to look like a real-life Polaroid. When that was done, I added some grainy texture to the whole thing to further make it look like a photograph. I wanted to have a New Year’s comic that was unconventional, funny, and a little sweet, much like Chapel herself. I hope you all enjoy the onset of 2013! Hey, we do that, too! Writing backwards makes it interesting. One year, we actually wrote an entire alphabet, just so we could make whatever message we wanted. I used two sparklers for letters with disconnected parts, like the cross bar of the t and the dot on the i. The real fun came when I tried to make a smiley face. I used two sparklers in my mouth for the eyes and made a big circle with the one in my hand. Wow, that's really cool! I love hearing other people's sparkler stories, it's really a fun little tradition. Yes, it was very fun!! My friend and I had good food, did sparklers of course, played board games, and watched Paranorman for the first time -- It was really great! I recently discovered this comic by a little accidental click on another site, and, well, this comic´s pretty swell. Keep it up. Thank you so much!!!! I hope you keep reading! Kidding, kidding. I've discovered this comic, and I quite like it. Happy New Year! Thank you so much! I'm glad you like the comic, and happy new year to you too! Happy New year to you Miss Emma and all the chapel's faithful! i feel i must say this while i can. I don't know if anyone will post in reply, much less read this. i feel i need to make this statement while i can. It's been an amazeing year. A year ago, i was a stranger here. now i feel like an extended family member. I am glad i have found this place. Last year had it's ups and downs. But this year i feel it's going to be much harder on me. I will have much more burdens and responsablitys on my shoulders. I will remain here posting as long as i can. i have been doing some deep thinking, and i am seriously pondering of running for a spot on my local county board of supervisors. Politics have been running deep in my family history, and i am feeling it's call to me. i have not commited to it yet, but i might do so this year. I'll let you all know if i do run. lastly, my fears still haunt me. If i stop posting for a long time and no one hears from me again with out me saying good bye with my reasons. .. expect the worst. I don't mean to scare you all, even more to you Miss Emma. I don't want you all to be heart broken if or when i am gone. right now i am still in good shape and sound mind so don't panic. I am saying this because i love you all. More so to Miss Emma and her family. I can predict many things that may yet happen. i just can't predict what will happen to me. I love you all, so stand strong and forge ahead with goodness in your hearts, minds, and soul. Happy New Year to you, too, and I wish you the best! I'll be honest, the past year hasn't been the greatest for me. There's been some depression and unwelcome feelings that I've struggled with, and still am, but there have also been some great things that happened-- especially my first time ever at summer camp. I know it might sound like a trivial thing to be thankful for, but sometimes the little things matter most. I made a list of goals to reach for 2012... I think I might have reached 2. This year I'm going to try to make my goals more realistic. I don't really make New Years resolutions, because I know I can't keep them. But goals are a little more inspiring for me, someone to work towards. And in 2013 I'm going to try my hardest. Haha, unreachable goals are a good thing. They help keep you grounded and they give you something to strive for even after you've accomplished everything else. They assure that you will never run out of things to do and stuff to work on. Better has no finish line and progress is all you can hope for. Emily, I admire how candid you are here! I hope your 2013 goes better than your 2012 did, and your optimism and level-headedness is super inspiring. To 2013! Oh my goodness! Leaving? I couldn't imagine! Taxil, you've become an important member of the Chapel community! It would be sad to see you leave. I hope this year is great for you, thought! Best wishes to everyone! I don't want to leave Miss L.S.P., but events in life might force me off the net. I have to remind you, i'm getting up in my years. I want to live as long as i can for you all. .... I just want to cover all the bases and not leave you all hanging and wonder what happened to me. Oh okay.... We'll miss you whenever that time happens to come. well, if God smiles on me, I should still be here when you get all grown up, get married and have kids of your own. (gives Miss L.S.P a hug) don't panic just yet alright? P.s I'm glad you posted this cause I would freak out if you didn't post for a while. Oh dear, Taxil! I hope you'll be okay...I wish you luck on your political run!! And I'm happy that you're thankful for the Chapel community...we're thankful for you too! Yes, Happy NYE to everyone!! I've never heard of writing with sparklers before, it looks really cool. I love the photo effects!!! It's really fun to try it, and I'm glad you like it! Happy New Years!!! I've been thinking Emma.... When are you going to do another livestream? I'll have to see...the problem is, I usually draw my comic on Thursdays now, when everyone is in school and wouldn't be able to attend my livestream. I used to draw the comics on Saturdays, which made it very easy to have livestreams. I'm hoping to start doing my comics on Saturdays again so I can stream them, but I can't promise when that might be. Okay thanks! I was just wondering because they're so much fun! Were you trying to make a heart in the picture of you? Thank you so much!! That is EXACTLY what I wanted to capture in this comic, so I'm glad you think I was successful! Thank you, I'm so glad! I'm so glad! What are your New Years plans? Oh, I dunno.... :| how about you? My best friend is coming over for a traditional New Years sleepover!!! It should be really fun! I'm glad you like the grainy effect -- and you won't have to wait long for Season Four, as the first comic premieres next week! I'm glad you're excited for it -- and you won't have to wait long! I'm always trying to teach myself new tricks and techniques! Yes, he does! It's quite sweet! I do try to be a Southern Gentleman Miss Emma, and speak politely as much as i can. Thank you so much!! That's SUPER sweet to hear!